The days of families huddling around radios to listen to their favorite nightly programs may be long gone, but the market for engaging audio programs hasn’t entirely diminished. In place of old-fashioned radio sets are headphones, smartphones, and apps that allow users to plug in and listen to thousands of audio programs covering a range of topics. Podcasts, which consist of episodes or segmented portions of an audio broadcast, are a popular digital medium for presenting information. Recently, podcasts have enjoyed more popularity through programs like This American Life, or its spin-off, the true crime series Serial. The New York Times recently reported that podcast popularity among American listeners increased 18% from 2014 to 2015, demonstrating that the demand for podcasting is increasing, despite the popularity of other digital media forms. By recording and posting their lectures as a podcast, teachers can make information available to students to access on their own time and at their pace. When a podcast is available online, students may also download lecture material to review at their convenience. 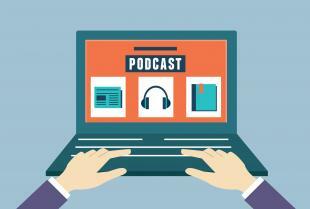 For educators looking to integrate more technology into their classroom and curriculums, podcasts are a great way to easily and professionally make content available digitally. Podcasts can be created in audio or video format, so teachers can experiment with the best form for their classroom. Podcasts also reach students of different learning styles and paces. For auditory learners, listening to a podcast may help them retain information better. Likewise, for visual learners, watching a video podcast lecture from a home computer or device separate the distraction of other students may be a more effective way to retain information. Regardless of your classroom audience, students today are increasingly digitally literate and have grown up in a media saturated, digital world. Podcasts represent a familiar format for students who are already used to consuming media in digital forms. When students can watch or listen to a podcast on their own time, they can come to class more prepared and engaged for classroom tasks. Reviewing course content on their own pace ahead of time may enable some students to feel more confident engaging with classroom material. Podcasts present a variety of benefits, for both educators and students. Ready to start podcasting your classroom lectures? Consider a Podcasting for Educators course, available from RiverStone eLearning and available on OpenSesame. Not a teacher or education professional? Don’t worry, the course still contains relevant and helpful information for anyone interested in getting started with podcasts. Check it out for yourself!